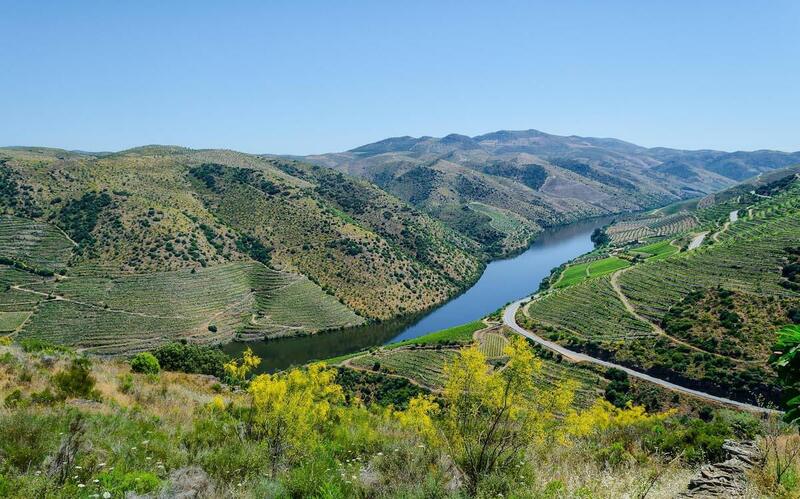 The 8th Biennial of Douro without limits. Assuming the responsibility of being the unique Biennial of graphic work of the country, its evolution since its origin in 2001, placed it on an unimaginable level today, abreast of the most important biennials in the world. more... To prove this, we highlight the exhibition tribute to world-renowned artists such as Antoni Tàpies, Paula Rego, Vieira da Silva, Octave Landuyt, Gil Teixeira Lopes, David de Almeida and others, but also by the breadth and internationality reached with more than 1.000 artists form 100 countries represented from all continents. Features 600+ artists from 70 countries. Majestic! 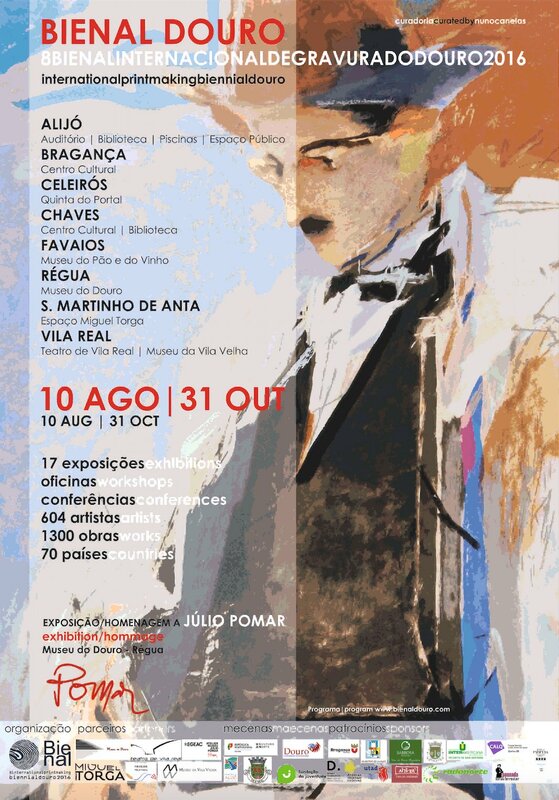 Júlio Pomar (Lisboa, 10 de janeiro de 1926) é um pintor português. Pertence à 3ª geração de pintores modernistas portugueses. Os primeiros anos da sua carreira estão ligados à resistência contra o regime do Estado Novo e à afirmação do movimento neorrealista em Portugal, marcando a especificidade deste no contexto europeu. Teve uma ação artística e cívica intensa ao longo das décadas de 1940 e 1950 e é consensualmente considerado o mais destacado dos cultores do neorrealismo nacional. Começa a distanciar-se do ativismo político e do idioma figurativo inicial na segunda metade da década de 1950 e, em 1963, radica-se em Paris. Sem nunca abandonar o pendor figurativo, liberta-se do compromisso neorrealista, enveredando pela "exploração de práticas pictóricas diversas que o centrarão na pintura enquanto tal, interrogando as suas formas, composições e processos, pintando das mais variadas maneiras na exploração ou na recusa das possibilidades que o seu tempo lhe abriu". Ao longo das últimas quatro décadas tem abordado uma grande variedade de universos temáticos, da reflexão autorreferencial ao erotismo, do retrato às alusões literárias e matéria mitológica. E do ponto de vista formal encontramos idêntica riqueza de meios e soluções. "A obra de Júlio Pomar constrói sucessivas cadeias de relações formais e semânticas entre os diferentes materiais, processos e técnicas". Grandes exposições realizadas nas últimas décadas (Fundação Calouste Gulbenkian; Museu de Arte Contemporânea de Serralves; Sintra Museu de Arte Moderna – Coleção Berardo; museus de São Paulo, Rio de Janeiro, Brasília; etc.) consagraram a sua obra, que se destaca como uma das mais significativas expressões da criação artística portuguesa contemporânea. António Canau , Julio Pomar's Exposition Commissary, was born in Portugal at Gavião in 1963. 2015 - Post PhD in Architecture in the area of Drawing and Visual Culture by the Faculty of Architecture of the Lisbon University. - The reformulation of the canons of the use of new digital technologies as an exponential element of the visual record obtained by the conventional tools of drawing, engraving, Photography and Sculpture . 2011 - PhD in Architecture, Area of Visual Communication. Faculty of Architecture - Lisbon Technical University. Thesis: Drawing with the acids: The Work of Bartolomeu Cid dos Santos. 1997 – Master of Arts in fine Art – Printmaking. Slade School of Fine Art – UCL. 1993 – Sculpture Degree with Distinction. Lisbon Fine Arts School – Lisbon University. 1991, 1989 - Portuguese Printmakers Cooperative.Mixed Media processes and Litography Curse. Teaches Drawing and Photography at the Architecture School of the Technical University of Lisbon, since 1998. Awards - 2011 – Portuguese National Fine Arts Academy Sculpture Award Gustavo Cordeiro Ramos 2011. 1992 – Youth Prize, III Amadora’s Print Biennial. 27 Solo Exhibitions, 66 Group Exhibitions, 17 Biennials in Portugal, and 86 International Exhibitions between 1984 - 2016. 11 Public Art Works in Portugal. Public Colections: U.K., British Museum, Prints and drawings Room, and Coins and Medals Department, Portugal, Modern Art Center, Calouste Gulbenkian Foundation and in Belgium, France, Hungary, Bulgary, Switzerland, Italy, Japan, Jugoslávia, Poland, Romania, China, USA. Pierre Granger Born in Algeria on 21st. of June 1935. The artist is now living in Brive-la-Gaillarde (France). After a career as a German teacher he is now retired. He has devoted himself to engraving since 1988. 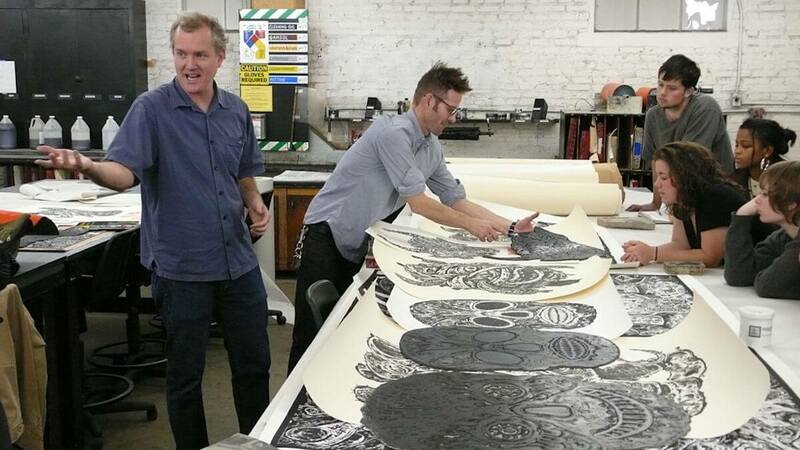 His techniques are traditional: etching, dry point, linocut and occasional mezzotint, but he has also been experimenting other printing processes. His work has been displayed in group exhibitions, both in France (at the triennial “Small Engraving” events in Chamalières among others) and abroad in his own exhibitions in France in Austria and in the Czech Republic, winning several awards. His themes are various (mythology, celebration of the tree, travels about the world for discovery, dreams of human conquests). Once selected, each theme is interpreted in several engravings, each one displaying a different approach, a different development. He Participated in the Douro Biennial without a single exception, since its first edition in 2001 and then received a Honourable Mention from the International Jury. Celeste Cerqueira (1967) is an artist and develops work in the field of visual arts . 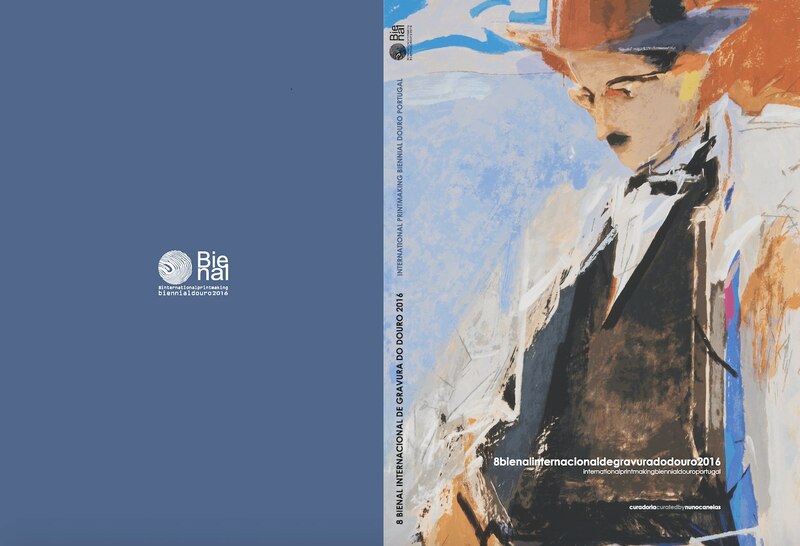 Has a Masters in Visual Arts - Intermediate University of Évora with the thesis " The interdisciplinarity in some contemporary works of art" (2007). In this context, its theoretical and practical production includes new features and artistic practices such as promotion of the group "What is Watt ?" 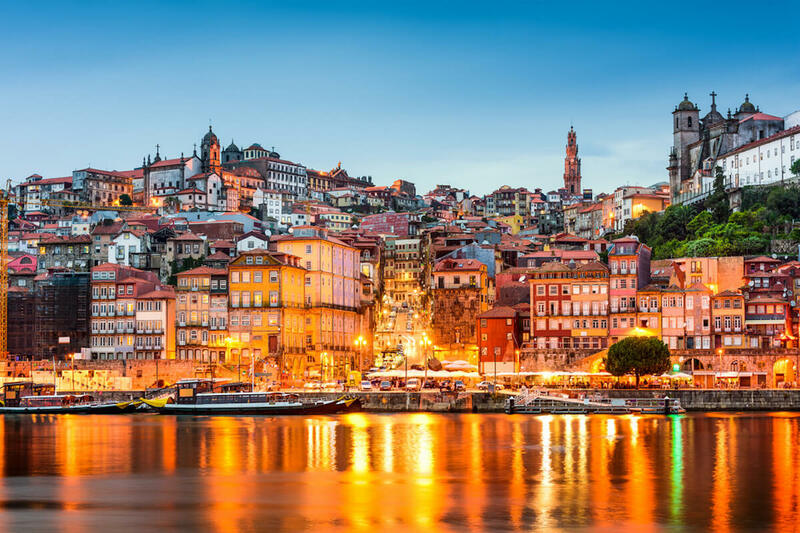 (since 2001) and most recently co- produced the Virtual Biennale presented in Vila Nova de Cerveira and the Biennale Douro Engraving. Lately it has been invited to participate in various exhibitions, which highlight the collective exhibition “Bienal da Maia – Lugares de Viagem” in the Maia Forum, presented the installation work "Our edges" and "Paradise" and the collective exhibition "Desobedoc – mostra de cinema insubmisso" in Cinema Batalha curated by José Maia, presented the installation "When is tomorrow?". This year participated in the exhibition "Um par = um ímpar" with the artist Silvestre Pestana at the Museum Teixeira Lopes (V. N. Gaia) and the exhibition "Em construção" with the artist Pedro Ruiz in Espaço Mira and curated by José Maia. Rania (Ourania) Schoretsaniti was born in Trikala, Greece. She is an icon painter with artworks in the monasteries of Meteora, Greece, as well as a painter and printmaker. She is educated in the School of Fine and Applied Arts at the University of West Macedonia, Greece, where she had tutors such as Yannis Ziogas in Painting and Dimitra Siaterli in Engraving. She spent, as an Erasmus student, one semester (six months) in a NHL Hogeschool, The Netherlands. She continued her studies in engraving at Athens School of Fine Arts, where she had tutor Biki Tsalamata. At present, she studies at MFA of Slade School of Fine Arts, University College of London, where she has tutor as Edward Allington and Lisa Milry. Exposes in solo and group exhibitions, Greek & international exhibitions. Her works can be founded in museums and private collections in Greece and abroad. Born in Funchal (1949), Silvestre Pestana distinguished himself in the ´7OS on the art scene in Oporto, developing work that used collage and calligraphy. Recently, the artist has shown a recurring interest in performance and light, integrating it with objects to emphasis, in the context of exhibition spaces, the presence of startling sculptural shapes. The artist has exhibited his work, throughout his career, in places such as Sociedade Nacional de Belas-Artes in nLisbon, Cooperativa Árvore, Galeria Quadrum, Galeria Alvarez and Museum of Electricidade in Oporto and he was contemplated this year with a big retrospective from his work in the Serralves Contemporary Art Museum in Oporto. The project Public Gallery for Digital Arts project dates from 2005 and participates again in this 8th Printmaking Biennial of Douro with digital works to be presented in three public panels, for the visualization of the artists’ works who submitted their files by web. In this event were invited the avatars artists Oume El Banine Slaoui (Tunisia), Ayelet Amit Yehudai (Israel) e Daniela Steele (Brazil). The works of these participant artists integrate in the dynamics previously promoted consisting of materializing the uniqueness that the new communication technologies allow, in particular the contact at a distance and the active participation in the construction of virtual worlds recognizable in online games. 1975 BA Bachelor in Art Education; Interamerican University of Puerto Rico, San German Campus. 1980 MA Master in Art Education, San Francisco State University, California. 1987 Lithography Class, International Summer Academy, Salzburg, Austria. 2002 Non Toxic Intaglio Class, Graduate Program, Interamerican University of Puerto Rico, Professors: Consuelo Gotay and Haydeé Landing. 1979 - Present Graphic Arts Professor, Fine Arts Department, Interamerican University of Puerto Rico, San German Campus; 2001 - 2004 Art Program Director, Fine Arts Department, Interamerican University of Puerto Rico, San German Campus.